Today's tutorial is for an "Owl Always Love You" card. It is super cute and fairly easy! You can of course customize it how you would like or do it exactly the way that I have here. It would be an adorable card to give to your boyfriend, husband, or friend. You wouldn't have to make it all lovey dovey. It all depends on your preference. Wanna find out how to make it? Keep reading for the tutorial! Step 1: With your brown marker, draw a tree branch coming from the edge of your card. Step 2: Draw the face and body of the owls. Step 3: Draw 2 large circles for the outer part of the eyes, the wings, and the feet. Step 4: Draw 2 circles inside the large circle. Color the pupil with the black Sharpie Thin. Make sure to leave a tiny white circle in the pupil. Color the wings and outline around the owl's stomachs brown. Draw noses and feet on the owls. Step 5: Color the boy owl's stomach with a light blue marker. With a red marker, draw a heart on his stomach. Color the girl owl's stomach with a light pink marker. With a dark pink marker, make humps on the stomach to create the look of feathers. Draw a bow at the corner of her ear and color it light pink as well. Step 6: Color the owls heads with a brown marker. Color their noses and feet orange. Step 7: With a black Sharpie Thin marker, add 3 eyelashes on the edge of the girl owl's eyes. Color the branch with a brown crayon. Step 8: Write "Owl Always Love You!" with a pink marker. Step 9: With your brown Sharpie Thin marker, (I used brown to match the owls) outline the words that you just wrote. Step 10: Color the blank spaces with your pink marker again. 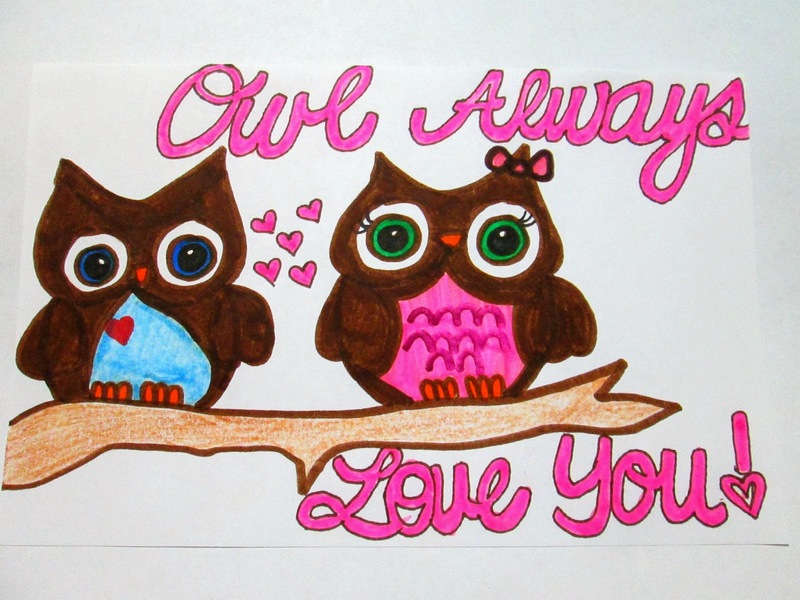 Draw 5 (it doesn't matter how many hearts you draw) hearts between your owls with brown sharpie and use the same pink marker to color them in. Oh my goodness!! This is so cute! You made it look so easy. I will have to try it. Love you! Thanks, Susan! You are too sweet. Love you too!